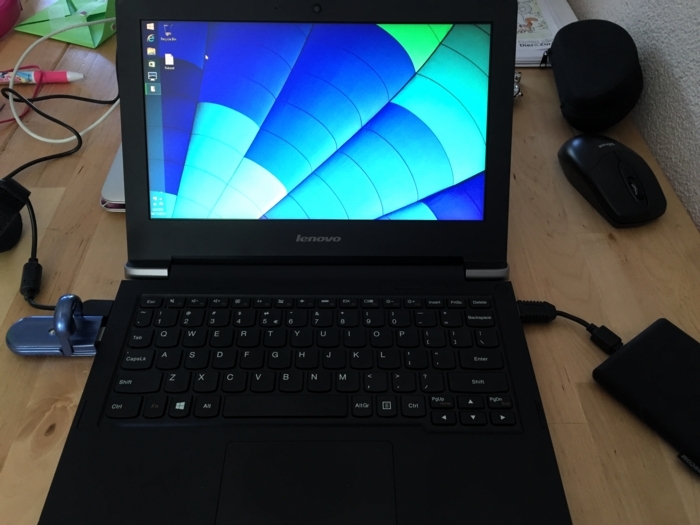 I recently was gifted a Yubikey Neo at the Blackhat Europe 2015 conference. I’d heard about Ubico’s nifty little USB device before but never really understood what the fuss was about. I’m no fan of Facebook or GMail, so instead I thought I’d see what Yubikey could do in a Unix environment! At the bottom of this article you will find a video outlining the final parts of the process: registering a new Yubikey and then using it for SSH MFA. Yubikey infrastructure: how does it all work? Generally speaking, any system that runs authentication based on Yubikey products, will communicate with the YubiCloud, e.g. the Yubico servers. In a corporate environment this isn’t desirable, which is why Yubico have created an open source, on-premises solution consisting of two parts: ykval and ykksm. YKVAL is the “validation server”, a set of PHP scripts that can be accessed by any system wanting to authenticate based on a Yubikey. YKKSM is the “key storage module” which stores the keys tied to the Yubikeys used in your environment. Any product desiring to use YK authentication will contact the ykval server to verify that the card in question is indeed valid and used by the rightful owner. To achieve this, ykval will contact the ykksm server and attempt to perform an encryption handshake to see if the card truly matches the expected signatures. Yubico provide open source tools and APIs that help you build YK authentication into your software. 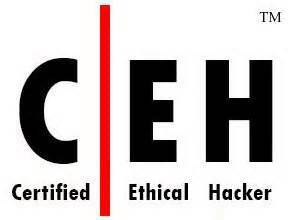 In the case of SSH (and other Unix tools), all of this can be achieved through PAM. There are many different options of authenticating your SSH sessions using a Yubikey and I’ve opted to go with the easiest: the OTP, one-time-password, method. I’m told that you can also use YK in a challenge/response method with later versions of OpenSSH. It’s also possible to actually use your YK as a substitute for your SSH/PGP keys. The AES keys stored in YKKSM cannot be the ones associated with your Yubikey product when they leave the factory. Yubico no longer make these keys available to their customers. Thus, in order to run your own local Yubikey infrastructure, you will be generating your own AES keys and storing them on the Yubikey. On the server(s) you will need to install the following packages through Yum: git-core httpd php mysql-server make php-curl php-pear php-mysql wget help2man mcrypt php-mcrypt epel-release. 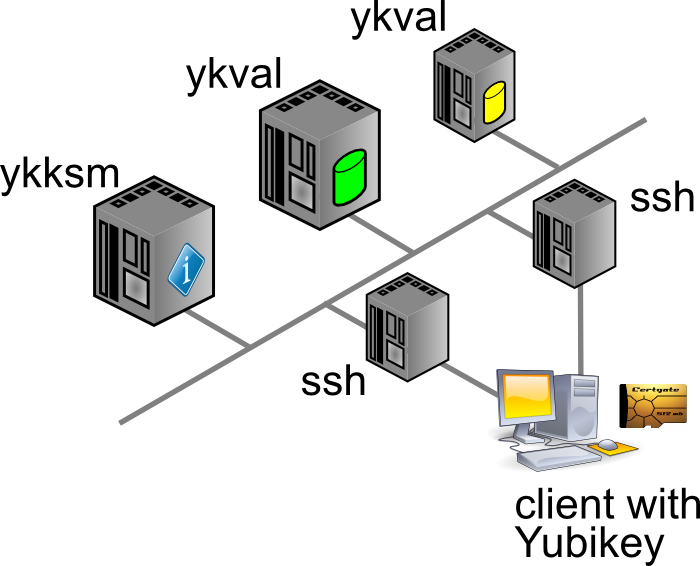 After making EPEL available, also install “pam_yubico” and “ykclient” through Yum. On the client(s) you will only need to install both “epel-release” and “pam_yubico” (through EPEL). Installing “ykclient” is optional and can prove useful later on. On the server(s) you will need to adjust /etc/sysconfig/iptables to open up ports 80 and 443 (https is not included in my current documentation, but is advised). Adjust the Makefiles for KSM and VAL to change the POSIX group “www-data” to “apache”. 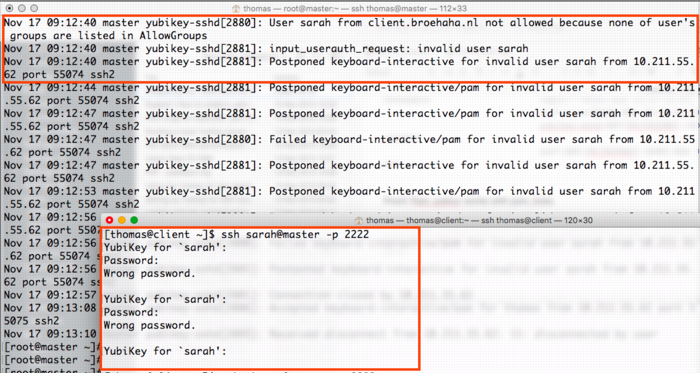 In the KSM Makefile, disable the line(s) that run the help2man command. They are not needed and cause errors. Edit /var/www/wsapi/2.0/.htaccess and ensure that it also includes the ykksm configuration directory. By default it only has the one for ykval. Restart both MySQL and Apache, to make sure all your changes take effect. 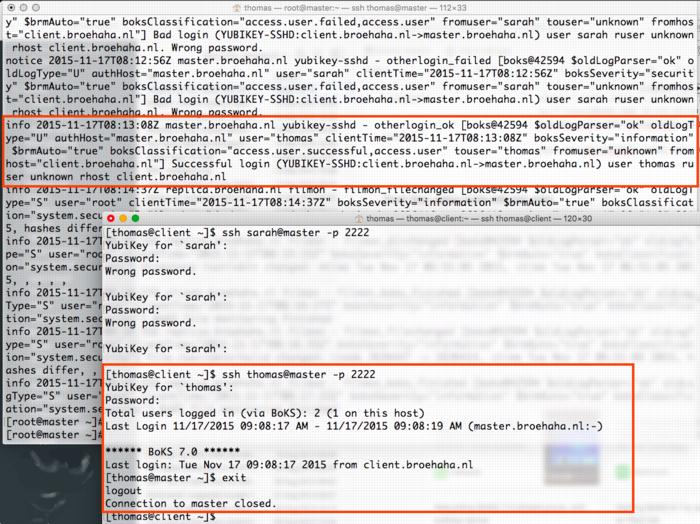 $ ykval-gen-clients --urandom --notes "Client server 2"
This has registered client number 5 (“id”) with the API key “b82PeHfKWVWQxYwpEwHHOmNTO6E=”. Both of these will be needed in the PAM configuration later on. Of course you may choose to reuse the same ID and API key on all your client systems, but this doesn’t seem advisable. It’s possible to generate new id-key pairs in bulk and I’m sure that imaginative Puppet or Chef administrators will cook up a nice way of dispersing this information to their client systems. You can run the actual test as follows. You will recognize the client ID (“5”) and the API key from before. The other long string, starting with “vvt…” is the output of my Yubikey. Simply tap it once to insert a new string. The verification error shown below indicates that this OTP has already been used before. For the time being you will NOT get a successful verification, as no Yubikeys have been registered yet. You may generate the keys server-side, in bulk or one-by-one. This allows you to hook into your other security tooling, automatically assigning a key to user accounts in LDAP and whatnot. You will then store the relevant data in each user’s Yubikey at a later point in time. You may generate the keys desktop-side, one-by-one. You’re generating the key at the moment that the Yubikey is in your hands and will then insert the relevant information into ykksm. This may be done manually through MySQL, by using the provided tooling, or you could build a nice portal for it. In either case you will need to so-called Yubikey Personalization Tools, available for all major platforms. Using this tool you will either input or generate and then store the new key onto your Yubikey. The good thing about the newer Yubico hardware products is that they have more than one “configuration slot”. By default, the factory will only fill slot 1 with the keys already registered in YubiCloud. This leaves slot 2 open for your own use. Of course, slot 1 can also be reused for your own AES key if you so desire. Slot 1 is accessed by issuing a short tap onto the Yubikey sensor. Slot 2 requires that the user press and hold the sensor for 2-3 seconds. In my case I’ve generated the new key through the Personalization Tool and then inserted it into the ykksm database in the quickest and dirtiest method: through MySQL. Further testing, does the Yubikey work? Now that both ykval and ykksm are working and now that we’ve registered a key, let’s see if it works! I’ve run the following commands, all of which indicate that my key does in fact work. As before, the OTP was generated by pressing the YK’s sensor. As I’ve mentioned before, for now I’m opting to use the Yubikey device in a very simple manner: as a second authenticator factor (MFA) for my SSH logins. We will setup PAM and OpenSSH in such a way that any SSH login will first prompt for a Yubikey OTP, after which it will ask for the actual user’s password. The great news is that Michal Ludvig has proven that you may also store this information inside LDAP, which means one less file to manage on all your client systems! Edit /etc/pam.d/sshd and change the AUTH section to include the Yubico PAM module, as follows. 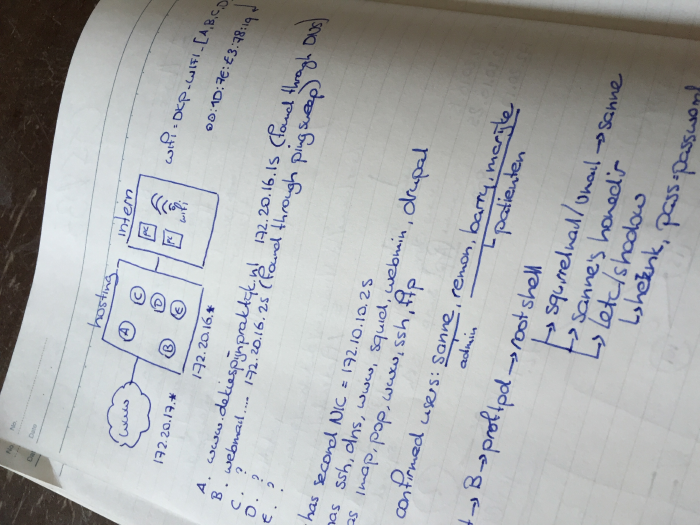 Substitute for the fully qualified hostname assigned to the ykval web server. Restart the SSHD and you should be golden! These will contain most of the useful messages, should either VAL or KSM misbehave.